For cleaning up your musical act, Restore is a first-class restoration plug-in package, knocking the spots off others we've tried. Easy to get good results. Best noise reduction we've used. Well thought-out controls. Perfect for film or dialogue work. DeBuzzer is scarily effective. Prior to the digital revolution, noise was a by-product of the physical media used to store music - remember the crackle of records and the background hiss of cassette? The transition to digital consumer formats banished such physicality-related artifacts, but noise is still very much a concern when recording. Background hum and noise can contaminate recorded parts, and can be caused by dodgy cables or grounding issues, or electrical clicking from devices on the same mains circuit (kettles, fridges, etc). Video can suffer to the point where dialogue is masked by wind or motor noise from the camera and, of course, material transferred from tape or vinyl may very well still suffer from the artifacts mentioned earlier. 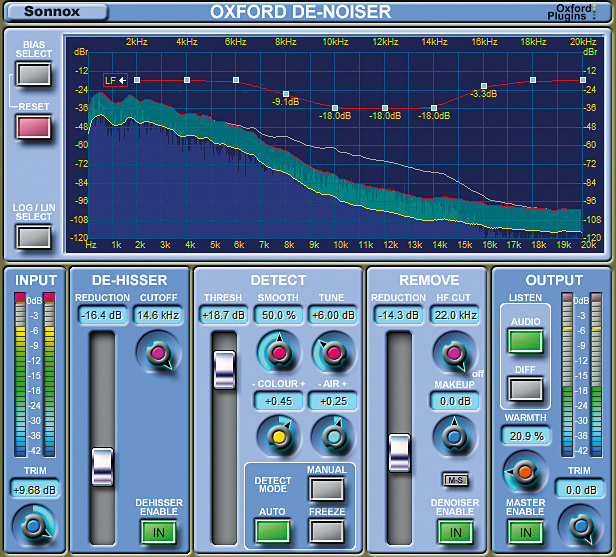 To combat noise problems post-recording, or to restore audio sourced from elderly formats, we can turn to noise reduction software such as Sonnox's Restore suite. 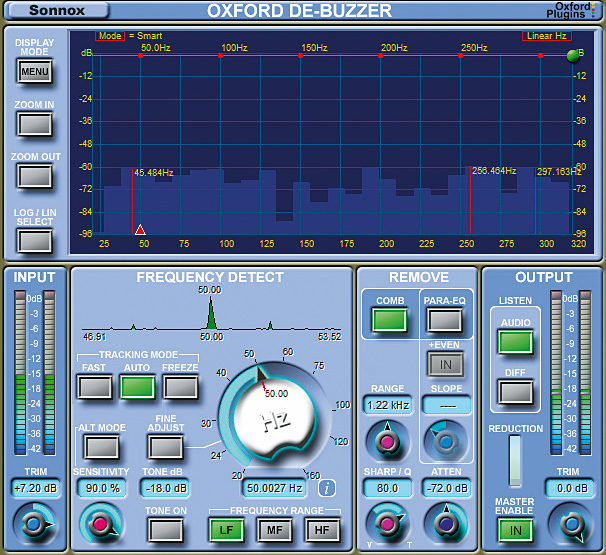 It features three plug-ins - Oxford DeClicker, DeBuzzer and DeNoiser - which are designed to suppress clicks, pops, crackles, scratches, hums, buzzes and noise. Restore can work at up to 96kHz, and if you need to use more than one plug-in, Sonnox advises placing the DeClicker first, then the DeBuzzer and/or DeNoiser, depending on which nuisance elements are most prevalent. DeClicker offers three sections, De-Pop, De-Click and De-Crackle, dealing with noise events of durations up to 10ms, 3ms and 0.4ms respectively. Each section has its own threshold and sensitivity controls, for dialling in optimal detection. 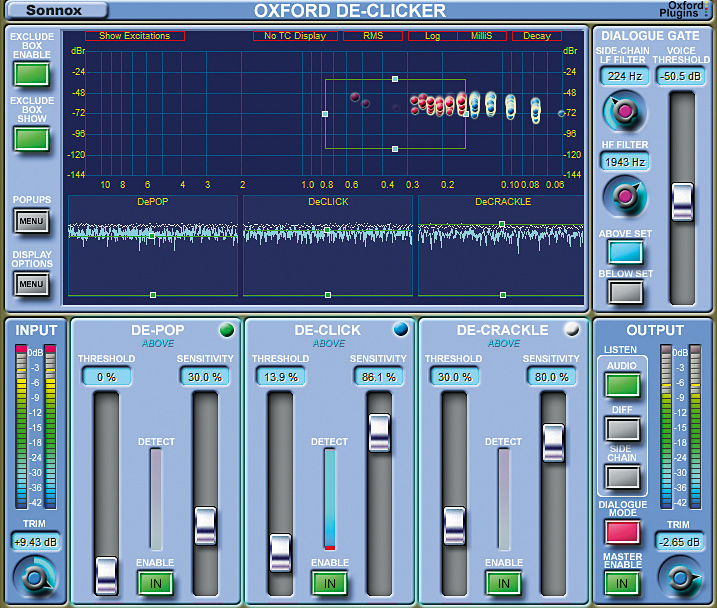 Once this is done, DeClicker's algorithms distinguish between noise events and audio content, the former showing up as colour-coded dots on the graphical display. With some types of material (eg, distorted guitars), the DeClicker can falsely flag up wanted audio events as clicks or crackles, but this problem is easily solved by utilising the Exclude Box function - a scalable box that you draw on the main graphical display to exclude events within a certain duration/level range from processing. "DeClicker's algorithms distinguish between noise events and audio content, the former showing up as colour-coded dots on the graphical display." Activate the DeClicker's Dialogue Mode and a bunch of extra controls pop up. This mode is designed specifically for dialogue restoration work, and works by separately categorising events as dialogue and non-dialogue, then enabling you to process them separately with two full sets of DeClicker controls. Thus you can use more aggressive settings on the non-vocal sections without adversely affecting the audibility of the vocal sections - very clever. In practice, it's pretty easy to do. You set the voice threshold control much as you'd set that of a noise gate, so any audio events breaching it are processed with the Above Set parameters, and the others with the Below Set. To fine-tune the way the DeClicker categorises events, there are sidechained low- and high-frequency filters and a real-time spectrum analyser, not to mention a level profile chart, both of which appear at the bottom of the main window. This mode can work magic on video footage, and despite being dubbed Dialogue Mode, it's suitable for other restoration situations where you need different settings for loud and quiet events. DeBuzzer offers hum and buzz removal, and operates using either a Comb filter for buzzes with many harmonics, or a more CPU-hungry Parametric response, for situations with fewer harmonics present. You can set the fundamental frequency of buzzes manually with the large Hz knob or by using the effective Auto mode, which quickly zeroes in on hum. You can set the sensitivity (to avoid over-zealous EQing), degree of removal in dB and much more besides. The remaining plug-in, DeNoiser, has three sections: Detect, Remove and De-Hisser. It's designed to remove constant broadband noise, such as tape hiss. 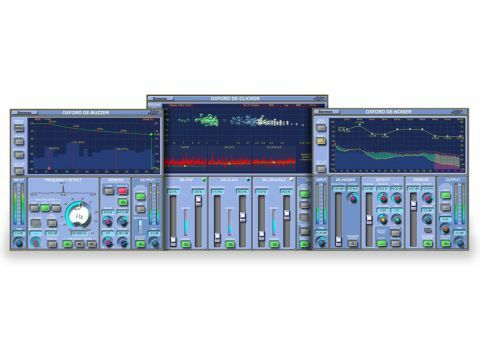 Like other such plug-ins, it basically works by breaking the signal into many separate frequency bands and individually gating them according to the settings. This works best when the plug-in knows the frequency curve of the noise (aka, noise profile), and the DeNoiser can automatically calculate this for you if required. To influence which frequencies are targeted most aggressively, you can drag points on the display to create a bias curve, eg, to remove more high-frequency noise. The Colour and Air knobs are simpler tools for tweaking the bass and treble response. To deal more effectively with noise that's constant in its frequency response, you can play back a section featuring only background noise (eg, between songs on a tape), wait until the plug-in has discerned the noise profile, then hit the Freeze button to 'lock' its profile. As with any denoiser plug-in, extreme noise removal can result in the audio becoming dull and soft, and to this end, there's a Warmth knob that reintroduces some of the 'lost' harmonics. There's also a De-Hisser section that works independently from the rest of the plug-in, for more aggressive reduction of treble noise. All three plug-ins enable you to audition the removed noise events using the Diff button (very handy for making sure you're not removing too much good audio), and they all have A/B functions and undo/redo. Sonnox spent 18 months on R&D for Restore and it really shows. They've done an excellent job of crafting a well-rounded set of intuitive, versatile tools that's perfect for almost any restoration situation and capable of bafflingly good results - we were able to salvage some audio material that we previously assumed to have been beyond repair. We used Restore to salvage material from old cassettes and vinyl, multitrack recordings on two-inch tape (that suffered from 'ghost noise'), and takes that had been infested with mains hum. We tried the plug-ins from iZotope RX (the Advanced version of which costs $1199) on the same material, and found Restore to be superior, both in terms of sonic quality and workflow (but note that RX also offers powerful spectral editing functions). Though the price tag puts it out of the reach of the casual hobbyist, for anyone who does a lot of restoration, mastering or film work, Restore could well be a sound investment and perhaps even an essential purchase.